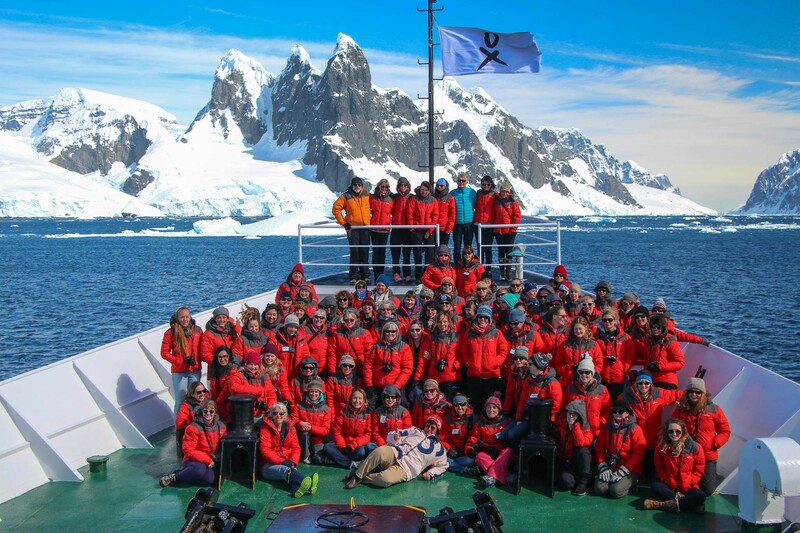 Seventy-six women from around the world were participants on the inaugural Homeward Bound Women In Science Leadership Expedition to Antarctica. The shapes, sizes and colours of icebergs, combined with the often dramatic light, created some stunning views. As members of the inaugural Homeward Bound Women In Science Leadership Expedition, we are on a mission. The purpose of Homeward Bound is to elevate the role of women in science and to enhance the influence of women on policy and decision-making, which will help shape a sustainable future for us and our planet. Women comprise a mere 30% of the world’s researchers and even fewer (about 9%) are in senior leadership positions in science (UNESCO). At a time when society faces some of its greatest environmental challenges, the world needs the science expertise and leadership that all of us can bring, both women and men. “Visiting Antarctica, to see and experience its amazing landscapes and wildlife and to go as part of a women in science leadership initiative was beyond a dream come true”. On December 2, 2016, we boarded our ship in Ushuaia, Argentina and headed across the Drake Passage to the Antarctic Peninsula. After a relatively calm crossing of the Drake Passage (some of the roughest seas in the world) we arrived at the South Shetland Islands, our first sighting of land in Antarctica. We spent the next 16 days exploring the Antarctic Peninsula, using small zodiac boats to get from our ship to shore, so that we could explore penguin colonies, view incredible geology, glacier-covered landscapes, and learn first-hand, about the impacts of climate change on Antarctica by talking with scientists at the Carlini (Argentinian) and Palmer (American) Research Stations. The Antarctic continent is covered by the largest ice sheet in the world. Here, near the Lamaire Channel, glaciers, mountains and sea ice made for a stunning and dramatic landscape. With the polar regions of the world warming at up to four times faster than the rest of the planet, Antarctica is a fitting place to learn about climate change and the critical importance of shifting to a sustainable lifestyle. Our ship, the Ushuaia, was our floating home as we explored the Antarctic Peninsula. Our leadership expedition was not a vacation. We had a lot of fun (including bum-sliding down snowy slopes; it beats a long, steep walk down), but we also worked really hard. When we weren’t out exploring the Antarctic landscape, we were in the classroom learning about what makes a good leader, about ourselves and our leadership capabilities and styles, about strategy and how it is critical to becoming influencers, and how to be visible as a means of creating influence and consequently change, in the world. We also learned from each other. Exploring the Antarctic's incredible geology, glaciology, and penguin colonies. At Baily Head on Deception Island, we went ashore with our Homeward Bound flag, as well as the Canadian flag I had brought with me, to take photos of our group. Sevenof us on the expedition were from Canada. We were proud to hold our flag amidst a backdrop of penguins and the rugged Antarctic landscape. We wandered up into the surrounding hills, where the penguins were on their nests, incubating their eggs and protecting them from the often harsh Antarctic spring weather. Penguins nest on rocky, hilly terrain as a way to keep their eggs and chicks dry from the spring snowmelt. As we hiked up into the hills, we were astounded to see the surrounding landscape covered with black and white dots. Each of those ‘dots’ was a penguin on a nest. We were told that the when biologist last estimated the size of this colony a few years ago, there were about 250,000 penguins here. It sounds like a lot and it is, but due to climate change, populations of most penguin species are in decline. The beach at Baily Head on Deception Island is a very memorable place for me. We landed on the black volcanic sand beach, greeted by thousands of Chinstrap penguins. Antarctica inspires us to do what we need to do to put the brakes on climate change and other environmental issues - it inspires us to action! Meeting an inquisitive Chinstrap penguin. Our work with Homeward Bound extends far beyond our expedition. As alumni of Homeward Bound, we are working together to develop collaborative projects that will support HB’s mission. One of my personal goals, and a dream in the making has been to run my own expeditions to Antarctica. In 2014, my dream came true with the creation of Biosphere Environmental Education, offering learning expeditions and adventures that show people firsthand, the beauty and fragility of the frozen continent. Antarctica may be 15,000 km away from us here in eastern Ontario, but our daily actions - the greenhouse gases we produce from driving our cars, heating and cooling our houses, and other daily activities - is having a direct impact on Antarctica. Sadly, there is truth in the saying, out of sight, out of mind. That’s why I want to take people to Antarctica (and other polar locations). When you see it first hand, experience it with all of your senses, it’s hard to ignore the large impacts that our daily lives are having on our planet. And experiencing Antarctica firsthand crates an emotional connection. Sculpted by winds and waves, the shapes and colours of icebergs was incredible, producing wonderful pieces of art. Anyone who has visited the frozen continent understands how it leaves an indelible mark on us. Watching a glacier calve is a sobering experience, a reminder that globally, our climate is changing. It also helps to make climate change personal and tangible. Antarctica makes us self-aware, aware of how each of us is contributing to the negative impacts on the environment. A Gentoo penguin (left) and nesting Adélie penguins (right). This Antarctic expedition was one of the highlights of my life. A guest writer on the Ingenium Channel, Dr. Shelley Ball holds a PhD in evolutionary ecology and population genetics, and was a member of the Homeward Bound Women In Science Leadership Expedition 2016. A biologist, educator, photographer, public speaker and storyteller, Dr. Ball is the founder and president of Biosphere Environmental Education, an organization which combines photography and exploration as ways of connecting people to nature and inspiring them to preserve it.